RePub, Erasmus University Repository: Crowdsourcing public perceptions of plastic surgeons: Is there a gender bias? Background: Implicit gender bias may result in lower wages for women, fewer leadership positions, and lower perceived competence. Understanding public and patient gender preferences for plastic surgeons may enable opportunities to address public perceptions. This investigation evaluates public preferences for a plastic surgeon's gender or demeanor. Methods: Members of the Amazon Mechanical Turk crowdsourcing platform read 1 of the 8 randomly assigned scenarios describing a hypothetical situation requiring a plastic surgeon to operate on their mother. The scenarios differed only by surgeon gender, surgeon demeanor ("agentic," traditionally more masculine versus "communal," traditionally more feminine), or type of surgery. Using a Likert scale, respondents indicated their agreement with 7 statements on surgeon competence, skills, leadership qualities, likeability, respect, trustworthiness, and, ultimately, preference as a surgeon. Independent t tests were used to compare scores. Lower scores indicated a more negative response. Results: Overall, 341 responses were received: 55.7% were male and 45.5% white. 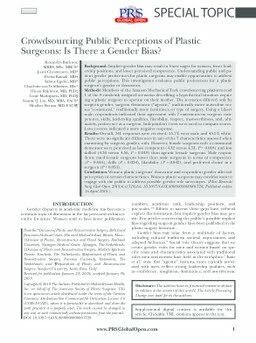 There were no significant differences in any of the 7 characteristics assessed when examining by surgeon gender, only. However, female surgeons with a communal demeanor were perceived as less competent (4.32 versus 4.51, P = 0.018) and less skilled (4.36 versus 4.56, P = 0.019) than agentic female surgeons. Male respondents rated female surgeons lower than male surgeons in terms of competence (P = 0.018), skills (P = 0.034), likeability (P = 0.042), and preferred choice as a surgeon (P = 0.033). Conclusions: Women plastic surgeons' demeanor and respondent gender affected perception of certain characteristics. Women plastic surgeons may consider ways to engage with the public to address possible gender role stereotypes.